KODE 1 Museum of Decorative Art – part of KODE Museums, one of Norway’s largest art institutions – is a rehabilitation project by 3RW arkitekter of all the spaces in the centenary building receiving the public, mainly through the insertion of a ‘cabinet de curiosité’ element displaying the museum’s archive throughout the spaces and creating a new dialectic between the public and the institution. 3RW arkitekter were the winning team to undertake a 100M NOK renovation of the key spaces of KODE 1, namely a new restaurant and shop, an interactive children’s room, conference room, library and a VIP lounge. 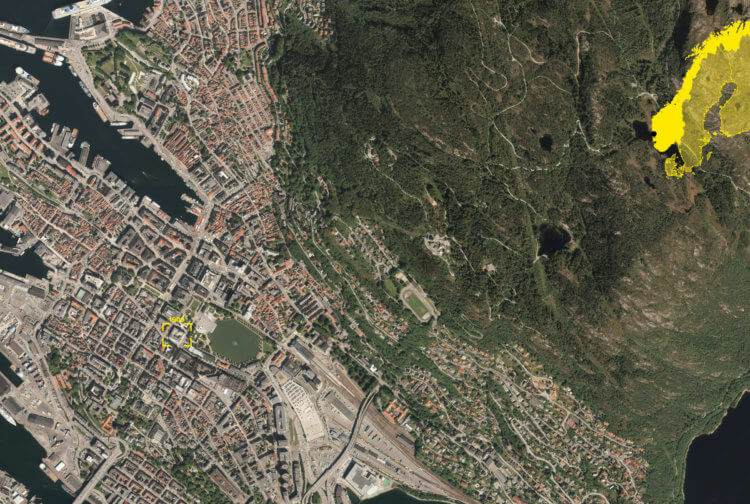 Located in Bergen’s cultural quarter, the 5000 m2 building built by Henry Bertram Bucher dates from 1897 and was erected as a cultural monument in the Italian Neo-Renaissance style, hosting the city’s permanent collection for fine craft and design ever since. The new KODE 1 Decorative Art Museum opens the institution to the city both visually and programmatically, finally taking advantage from its position in the crossing between Bergen’s cultural axis and the classical city plan between the mountain in the east and Nygaardshøyden with the university and museum park in the west. Visually, this cultural axis is expressed through a colourful tiled floor based on a former floor pattern found during demolition, providing an immediate visual connection between the cultural institution and its city on ground floor. Previously a disparate collection of cluttered small spaces of poor quality, the refurbishment reorganizes the museum spaces and exposes the reserves of the museum – previously inaccessible – in the form of a revisited principle of a ‘cabinet of curiosity’. In its new form, 3000 design items are made public and brought up into the space from the cellar where they were stored previously. This unfolding wall contributes differently to the spaces it creates throughout the museum: as an exhibition wall and as a filter between the publicly accessible spaces of the museum – the cafe/restaurant, shop, children’s room, conference room and library space – and the working spaces of the museum, for the first time exposed to the public. New modular furniture was created to form the new reception desks, restaurant and event tables, bar, and series of shop displays. These were inspired from old Norwegian museum displays with slender steel units and flexible arrangements. A white steel mesh ceiling and custom-made carpets and curtains complete a list of key interior elements that were added to the museum to give it a new civic presence. From the study phase until its opening in May 2017, 3RW arkitekter worked closely with the various museum teams – including museography, scenography, restaurant manager, reception, boutique, library and security – to ensure an integral cohesion and link the programmatic diversity of the building now inserted with new civic life. Clearing the museum from the opporstunistic profileration of small cluttered rooms built in the last 40 years is a crucial starting point to give back to the institution a set of grand and functional spaces, that are flexible in the future. The clearing process also gave rise to new opportunities to enhance the quality of the existing structure. The central part of the project is the insertion of a series of display walls, a reinterpretation of the ’cabinet de curiosité’. A new exhibition cabinet wall has been built at the scale of the building, inserted throughout the museum to create and frame different spaces, at times serving as a back drop exhbition wall, and at times as an enclosure. This establishes a new dialetic between the thick stone walls of the old institution, the museum workspaces and the public. To achieve visual connectivity between the archives and back-of-house activities of the museum, and the public areas, the wall has security levels that are made possible by a succession a layers. The character of the interior is defined by three main elements: the internal display wall of natural dark oiled steel; colourful cement tiles with an ancient pattern found during the demolition process; and a custom-made, white metal mesh ceiling. All these elements are based on a 1600 mm grid that runs throughout the project. This set becomes the new language driving KODE 1’s rehabilitation. The tiles and the ceiling are designed as a dialogue between the traditioanl geometry and its abstracted interpretation. The main elements are supported by warmer additions: a wooden floor; a series of custom-made carpets and curtains featuring old plans and photos of the museum; and a golden element accentuating the public access from ground floor to the top floor. On ground floor, a new ’carpet’ of tiles extending the whole floor was devised, inspired by the few orginal ones found during the demolition process. 21250 tiles for 900m2 were handcrafted in Spain using the same method as the old tiles, one can see under a glazed floor in the back of the reception. On the top floor, the existing wood floor, at first judged unusable, is reassessed and simply shaved and oiled to become a cost saving and high-quality feature for the upper levels. Rather than hiding the 130 year-old, 7cm-thick pine floor, it is given back its original eloquance and perfume.